Ni: Gandalf usually foresees events long before they happen, and is rarely surprised by anything. He is usually working behind the scenes to some greater purpose that others are oblivious to. He chooses people specifically for their unique abilities in order to complete various tasks that he doesn’t have time for himself (Frodo for his strong will to bear the ring, Bilbo as a burglar to keep the dwarves in check). He strategizes long-term, paying attention to both the big picture and the details in order to prevent disaster and works toward it unceasingly, step by step, regardless of barriers to his path. Gandalf does nothing without a purpose and is good at figuring out symbols and riddles. Fe: Frankly, Gandalf often finds Te users unreasonable. He’s frequently annoyed with Thorin’s inability to take others into account, and chooses Bilbo specifically because he knows he’ll be able to keep Thorin’s greed in check. Gandalf seeks large-scale harmony among people and races and likes external approval for his choices (sharing a smoke with Bilbo eh?). Gandalf is generally kind and polite, and values those same traits in others (Thus, the constant “Fool of a Took!” to Pippin, who isn’t traditionally mannered). Gandalf gets annoyed at contention among his friends and doesn’t put up with irresponsibility. Ti: Gandalf doesn’t like to be in charge of everything, but prefers to delegate most tasks to others. He doesn’t always trust his judgement, but will often leave things to others rather than trying to put his foot in everyone’s game. He does most of his thinking in silence, which makes him both very mysterious to his friends, and quite apt at working behind the lines without screwing up. He prefers analysis to action when he has the option. Se: Gandalf loves nature and enjoys spending time with the elves. He doesn’t care much for thrills or battle, but doesn’t have a problem jumping into a fray when he is needed. He pays attention to the environment and uses it to help him get out of tricky situations (tip #1 when captured, find a moth and tell it your secrets). I see Gandalf typed (stereotypically) as an INTJ all the time. However, I’d advise everyone to consider the following questions before jumping to that conclusion. And remember, this is about thought process more than apparent behaviour. Does Gandalf choose the most efficient person to complete each job he delegates (Te)? Or does he choose them based who he feels will be most loyal to the job (Fe)? Does he manipulate primarily emotions or thought processes (Te vs Fe)? Does Gandalf organise people to action (Te)? Or does he simply throw them together without specific instructions and hope they manage to work out what he wants them to do (Ti)? Does Gandalf communicate directly about tasks (Te)? Or does he disappear on his own without ever communicating what others should do in his absence (Ti)? Does he work toward organising his environment (Te)? Or putting it in harmony (Fe)? Does Gandalf see the greater good as more important than the individual (Fe)? Or does he see individual sacrifice as requisite for necessary tasks to be completed (Fi)? Does Gandalf merely get annoyed with incompetence (TeFi)? Or is he quick to anger (as he says most wizards are (FeTi)? Does Gandalf work better if he talks out loud and writes things down when problem solving (Te)? Or does he prefer to work in absolute silence (Ti)? Yes, I do suppose Gandalf the Grey is vaguely different from Gandalf the White, but the personality itself never stood out as uniquely different –merely the methods. 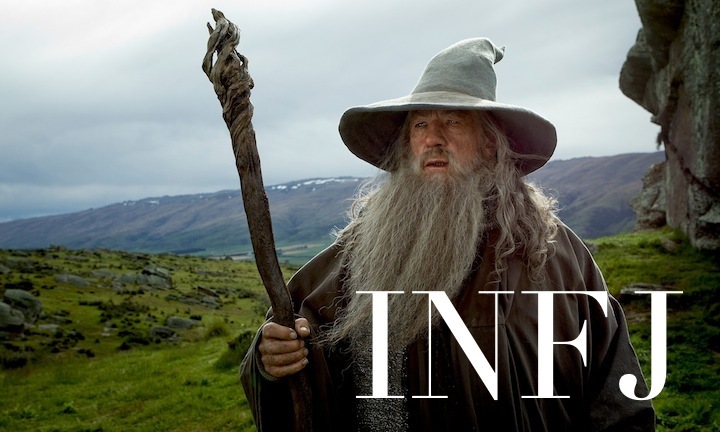 To be honest, Gandalf strikes me as an extremely mature INFJ who has learned how to be objective, but then again, we could very well go both ways with many of those questions. Fe is quite evident here. Sorry, I am confused by all this dicussion. How can you not see Gandalf is a stereotypical old INTJ ? Wizards are the ultimate scientists. It seems to me you want to have him in your INFJ because he is such a cool character. It strikes me you know little about INTJs, my friends. You’re right. I don’t know anything about INTJs. You have some fair points. As for your question about TeFi vs FeTi, these are some of the questions that I asked as I was writing up this post (just for reference, I’m basing this off the books rather than the movies). Thoughts? If you think I’ve pegged Gandalf’s motives and thought process completely wrong, please do tell me because I’m always looking to improve the site. Now I’m going to do what all cats do. Walk away until you contact me. But not on the phone. I hate the phone! If you sound like Tom Hiddleston then I will die out of pure reflex. Are you happy now!? And yeah, one more thing: Thanks for playing with me. I had fun. Unfortunately I do not sound like Tom Hiddleston…I’ve got a Liverpool accent so I suppose I sound bit less posh. It’s been 3 months and I’ve been ill and also somewhat of a coward so I’ve been avoiding your blog. All in all I just want to say sorry for the crazy things I wrote in September. I came down with paranoia that night and ended up being hospitalized for 6 weeks. I thought your site was a clever game I could play with and I did. I just feel stupid when I think back on how I was thinking then. I hope you can forgive me and that I didn’t write something too rude or stupid. I don’t remember all that well. The comment about Hiddelston stuck though. So awkward. Gawd, I want to crawl down into a ditch and die when I think about it. But oh well… the cat is out of the hospital – I mean bag – and I feel better now. Sorry once again if I wrote something bad. Take care! Honestly, I’m so sarcastic myself that there’s no way I could have taken offence at anything you said. Please do not crawl into any ditches –especially if you’ve been ill. You wrote nothing to offend me and I certainly would be glad of your continued friendship (although I have never met you). I like how you expanded upon your idea here and showed some of the questions considered when typing Gandalf. I think you should include it in the original post under the break line, after the final sentence. Sure, Gandalf is polite and he’s friendly. It allows him to get close to people and become well liked which also makes it possible for him to manipulate people through their feelings when he sees something he thinks should be prevented or changed. He’s moving people around like chess pieces without a care or a thought for how his manipulations affect the feelings, thoughts or lives of the individuals involved. He’s very goal oriented. The greater good is always his main priority and he’s willing to sacrifice anyone for it – even if it makes him feel (a little bit) bad – because he thinks it’s the right thing to do. Thorin’s close-minded Te annoys Gandalf, yes, because Gandalf can see the big picture and the advantage and value of respecting others in order to preserve peace and harmony in the world. Obviously Gandalf can’t do his job as a wizard very well or efficiently if he’s blunt or rude. Gandalf seems to be a genuinely good guy, deep down, so it’s easy to like him, but he’s clearly got no scruples when it comes to using people for whatever he thinks needs to be accomplished. His ability to make people trust him and like him is impressive and he uses it to impose his own moral on people through manipulation, which is very clever, but also somewhat cold. That trait in him becomes more noticeable when he returns as a white wizard and appears a lot more aloof, emotionally. The white robe (finally) gives him a powerful new position in the eyes of society which means he no longer has to manipulate people the way he always did as Gandalf the Grey. He can speak his mind and people will automatically listen to the white wizard. As a result Gandalf the White is a lot more direct and blunt and even forceful. He’s still a good guy, but there’s really no doubt any more that the greater good means more to him than the people he has to use to achieve it. I wouldn’t say he doesn’t care about people at all though. He’s very fond of Frodo for example, but if someone where to accuse him of using Frodo and being the reason why Frodo got emotionally and physically scared for the rest of his life, then Gandalf probably wouldn’t see a problem with that. The Ring was destroyed. The mission was accomplished. The greater good prevailed. Frodo had to suffer for it and Gandalf would be able to feel sorry for him, yes, but no doubt the good cause won and because of it Gandalf is pleased. Job well done. He cares far too much about coming off as polite to be Te. Plus, Fe, especially with the combination of I and N, would naturally be very introspective and could come off as a Te. Due to the combination of an INFJ they seem to often be mistaken as extroverts due to their strong drive to accommodate people’s feelings, and they are often seen as Te due to the stereotype that Te versus Fe means that Fe doesn’t think. INFJ’s are typically one of the most intellectual of the MBTI, often more so than every Te type except INTJ and INTP. This is based on IQ though, which only tests a certain kind of intelligence. Another study looked at actual academic performance, and INFJ was #1. Yeah, that last bit about academic performance would probably be due to INFJs caring more about school than INTJs and INTPs…I find that INTxs are extremely likely to hate school (but love learning) and as a result, their academic performance doesn’t end up reflecting their actual intelligence. INFJs have always differed in that they approach school as a personal responsibility, rather than as a necessary evil. INFJs take school seriously to a greater extent than INTxs, so their performance tends to be higher academically. Academic performance has much more to do with enneagram than MBTI I believe; as enneagram focuses on desires and fears whereas MBTI on how one processes and deals with the outside world. A type 3 or 8 INTJ (or other type) would value achievement / power, and so would be much more ambitious and likely to put emphasis on academic performance than a type 5, who would value learning for the sake of learning and therefore not care that much about grades. What is the goal of his being polite? Politeness is a skill that will get you far in life, and it is important when you are dealing with creatures everyday who are very much run by their feelings. It reveals less about how you feel about people, and more about your value or respect of your neighbors. Perhaps you have heard the phrase, “you catch more flies with honey than vinegar”?